As the speed of technology has increased, so has the fear that we will miss out if we don’t stay constantly plugged in. Can you sense what you are unplugging yourself from in order to match the impossible pace of our culture? Capitalism demands cycles of growth that are unsustainable and social media asks us to be on top of every new story and trend at every moment. Where is the time and the space we need to digest these conditions, filter out the toxins, and make choices that align with our own values? As our days feel ever more accelerated and our time compressed, slowness and patience often feel like luxuries we can’t afford. More and more, though, these qualities are becoming languages we have forgotten how to speak—locations we have forgotten how to map. “No Rush” is a spell about slowing down. This is a spell to counteract the pervasive message in our culture that says “more is better, faster is better.” This is a spell to help you remember slowing down is subversive. Call in spaciousness and vast, uninterrupted time, and you are actively challenging the harmful currents of the mainstream. You deserve to be fully present in your life, no matter what demands your schedule makes on you. You deserve to pursue your interests deeply, to turn over ideas and creative inspiration slowly, to let something gestate and then blossom in its own time. To do this is to claim your very own process of becoming and maturing. To do this is to refuse to be rushed away from the experiences that make up your life. Let time fill you and hold you this month. Let your mind pause and rest so that your present surroundings can expand within you. Recognize where you can let yourself spill out to fill much larger spaces and imagine the qualities you'd like to grow in such a space. Your nervous system is designed to take your energy levels up and down, but it is not fluent in the language of thought. To remember how to speak the language of slowness, of peace, and stillness, come to know your own breath as communication. Every exhale, you say to your over-worked system: it’s okay to relax. Your inhale follows, and with it you’re given another span of time be quiet and still, until the exhale comes again and says to your whole being, it is okay to be here, to do nothing, to be nobody. So even though you inhale again, you do nothing… And as the next exhale comes, perhaps you can feel how okay it is to be quiet and present to the rhythms of your body—to hear what you hear, smell what you smell, know what you know... or, perhaps you feel the mind pulling you away from slowing down. It doesn’t matter what you feel because, either way, you are still right here breathing, doing nothing but settling down into this luxurious nothing. Doing nothing but noticing the boundaries of this nothingness effortlessly expand. Doing nothing but further emptying out the space that you are... Stillness can be found in any amount of time. You choose when to notice it and invite it in, but remember, it is everywhere, all the time, un-moving and un-rushed, simply waiting for you to find it and settle in. A note about resistance: slowness is one way to reconnect with wholeness. As delicious as this might sound to our longing and our loneliness, our fragile sense of self can feel threatened by such a release. Remember, slowness and wholeness are not threatened by this resistance: all of you is welcome here, all of you is invited to rest and to be held. Corina: This is a portrait of our mother's garden, right outside the room where we were painting last summer. Foxglove (digitalis purpurea) has medicinal properties supporting the heart, and as a flower essence helps clear stuck thought patterns. I also love the way it blooms, from the bottom to the top, so that you see many stages of buds and blossoms at once on one stalk. This offers a spell I need very much, and I noticed as I was painting it how frantic I felt to finish it and move on. It really smacked me in the face with my own workaholic tendencies, and how much I rely on rushing! Even with all my hustling (or because of it), this was actually the image that took the longest to finish. We worked on it steadily during our entire time together, and kept tweaking it digitally right up until the print date. Jocelyn: Over the years, Corina has encouraged me to draw more and I have encouraged her to paint more. Each time we switch out of our typical collaborative roles, our collaborative process is asked to change. This image is Corina’s vision and she did much of the artistic work for it. I mixed some colors, consulting with her about the image, and did some of the digital edits, but I see this one as more Corina’s than ours. I have grown to love this painting very much—it has taken me time to drop whatever attachments I have to the way I paint and really open to Corina’s vision for this piece. Also, in our partnership this summer, I was the one asking for slowness and it felt so supportive to have Corina put her energy into a spell for slowing down. We've got a sale going on this image for the whole month of April! 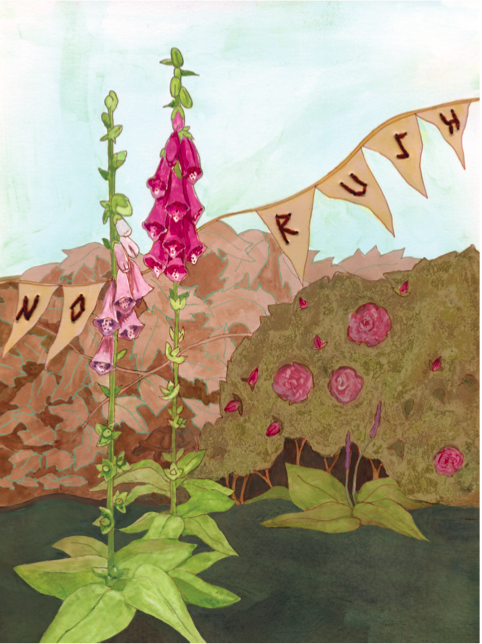 Buy a print of No Rush and get 15% off, using the coupon code NORUSH. Corina is offering a discount on relationship readings for anyone who needs a little extra help navigating intimacy, until April 15th. This April, Jocelyn will be finishing up her semester and trying to squeak out a publishable manuscript. You can Follow her on Instagram @jocelyncorvus to check out all the ways she is distracting herself from these two sizable tasks.